Hello, indulgence! When the perfect flavour meets extra soft texture. 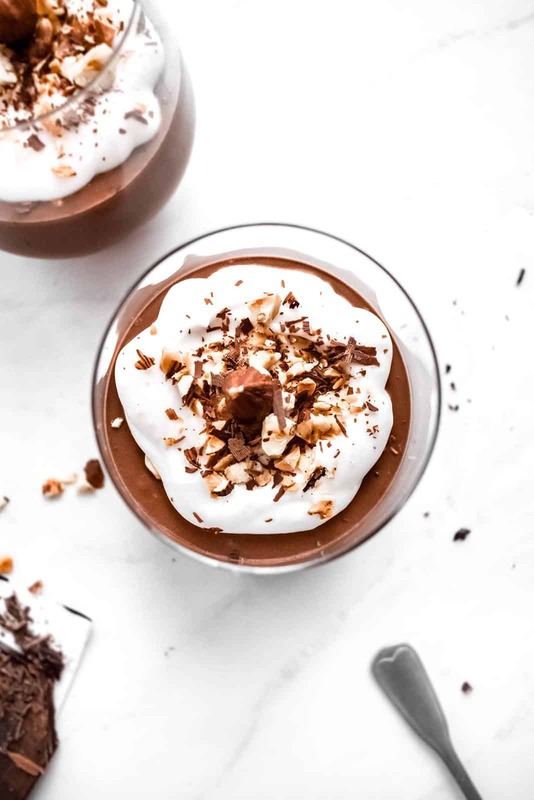 This vegan chocolate & coconut mousse is absolutely packed with flavour. Easy, quick, delicious and low in sugar. It’s based on coconut and dark chocolate, while also being fully customisable. It wasn’t until I reached the age of around 12 that I first tasted chocolate mousse. I was always a fussy easter (still am) so when my mum realised I LOVED chocolate mousse, she absolutely wouldn’t stop buying it. I’ll never forget her stocking up on store bought mousse in black and gold packaging, which was to be my favourite dessert of years to come. My love for decadent chocolate mousse grew even stronger in my early 20s. My girlfriend introduced me to the dessert of my dreams – chocolate mousse with little pieces of brownie fudge. Talk about perfection! airy and melts in your mouth. 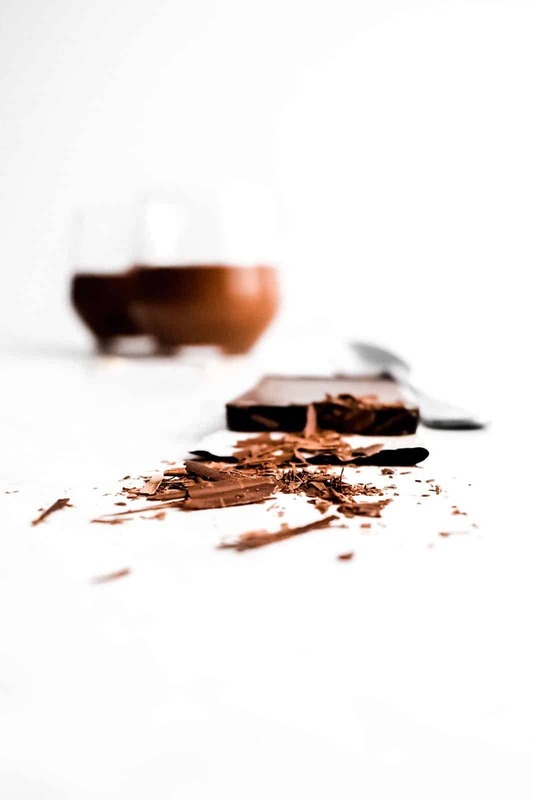 Choose dark chocolate with 70% cocoa solids to make this ultimately rich vegan chocolate dessert. Similarly, to my peanut butter & chocolate brownie recipe, this one took a while to figure out. 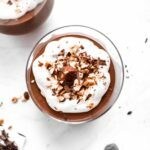 If you’ve seen any other vegan mousse recipes, you will know that a vast majority of them are based on avocado. Whereas I appreciate the health benefits of avocado fat, I am allergic to it so using it as a vegan mousse base was out of the window. Instead, I decided to use coconut milk (works with both normal and reduced fat coconut milk). This not only serves as a fantastic base, but also adds subtle coconut flavour. You’ve been warned. 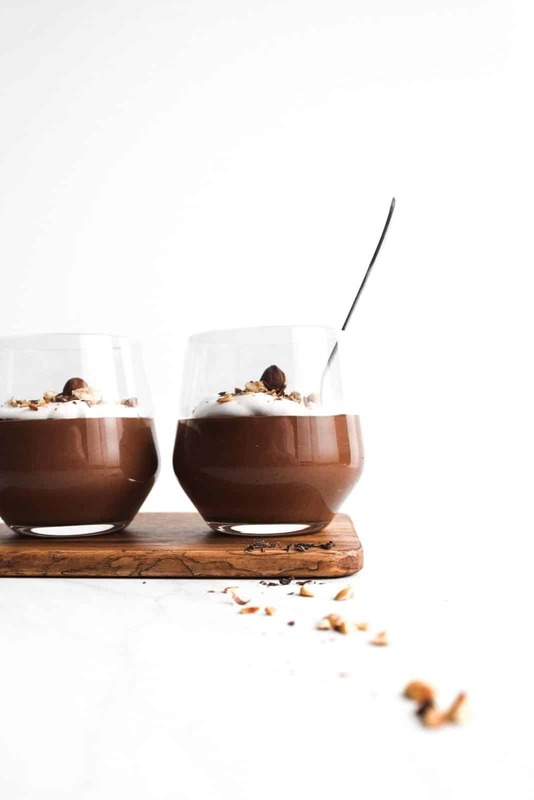 When it comes to any vegan chocolate mousse, practise makes perfect. Are you organising a big dinner party or thinking of surprising your partner with this mousse for Valentine’s day? Or perhaps making this for an avid chocolate lover’s birthday party? Make sure the big occasion won’t be the first time you’re trying out this recipe. 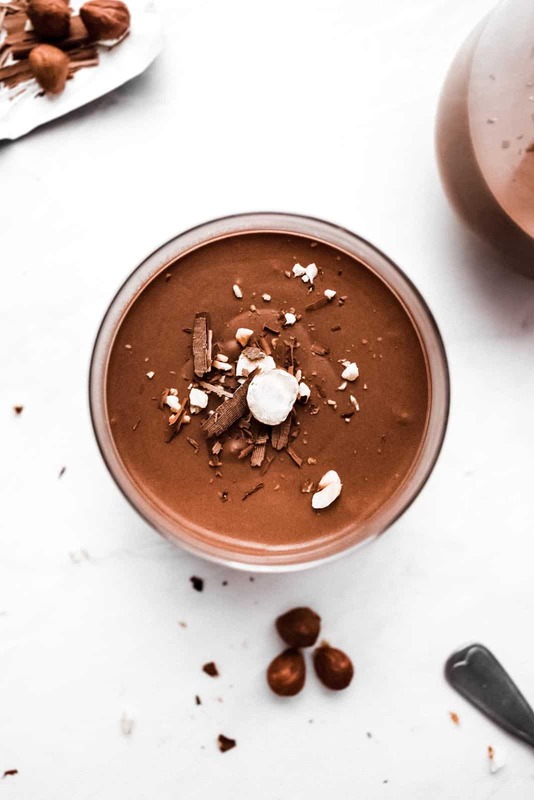 I know this is a very generic advice that could be applied to anyrecipe (but admittedly not a rule I always adhere to …) Nevertheless, making vegan chocolate mousse can be a tricky business. Looking for more vegan dessert inspiration? Why not try out my extra decadent rose hot chocolate or treat yourself to my ultimate vegan shortbread biscuits. 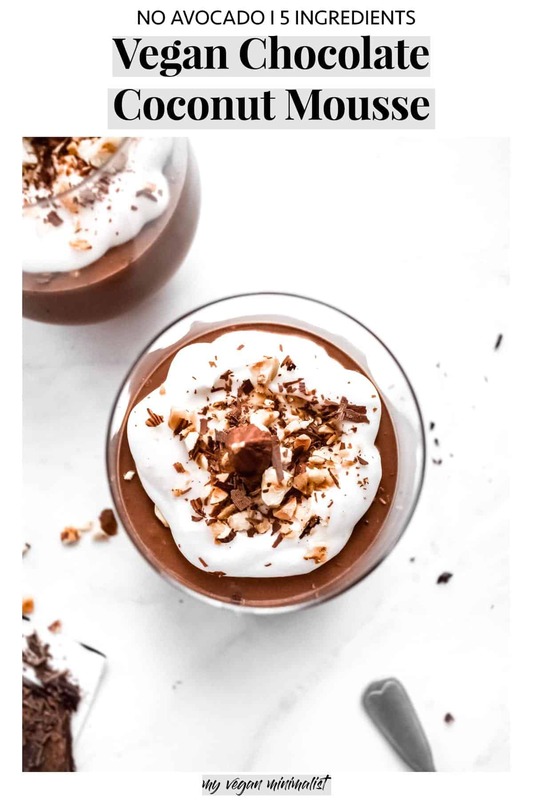 Pour coconut milk, chocolate and water in glass bowl. Melt the chocolate in the coconut and water mixture and stir to form a smooth mixture. Add in sugar and vanilla essence and mix. Now is also the time to also add any additional flavourings you might want such as orange or almond essence. Place your hot bowl in ice cold water and whisk mixture until you can see soft rings through the mixture as you mix. The longer you refrigerate it for, the more your mousse will set. I usually refrigerate it overnight before serving, but that is not necessary. CAUTION: do not over whip! If you over-whip the mixture it will become grainy (the chocolate becomes so hard that it separates from the water again). If, however, you have overwhipped it and are left with a grainy texture, there is still a way to save it! Simply heat it above a hot bowl again and melt your mixture again. Important! Please keep in mind that this is a very low sugar mousse option. I have used 70% dark chocolate, which creates a gorgeously rich, but not overwhelmingly sweet mixture. Make sure to add more icing sugar or use chocolate with less cocoa solids if you’re hoping for a sweet mousse!